I think the heat broke a little bit. It’s at least 3 degrees cooler than it was before. I’m thankful for the little things. I’m also thankful for this salad. Sure, I know what you’re thinking. It’s pasta salad, big whoop. Normally I steer clear of pasta salads on buffet tables since they’re usually laden with gloopy mayonnaise or bottled Italian dressing. No thank you. But this salad, this pasta salad, is perfect. I attribute the perfectness of this salad to the fresh dill snipped from my garden. There’s enough of it to pack quite a punch and along with the fresh cucumbers and tomatoes, it makes for a delicious summer meal. Something easy enough to pack on a picnic or whip up for a quick weekday lunch. Leave it vegan or top it with some feta cheese, either way, it’s delicious. On my last post I mentioned that I’d be away on holiday. My husband and I are flying off to Montreal, renting a car and driving around New Brunswick, Nova Scotia and Prince Edward Island to camp, road-trip, couch-surf, and experience the lovely Maritimes. Got any tips for us? Leave a comment with any recommendations, as they’d be very much appreciated! Cook pasta in salted water until cooked al dente. Cool under running water and drain well. 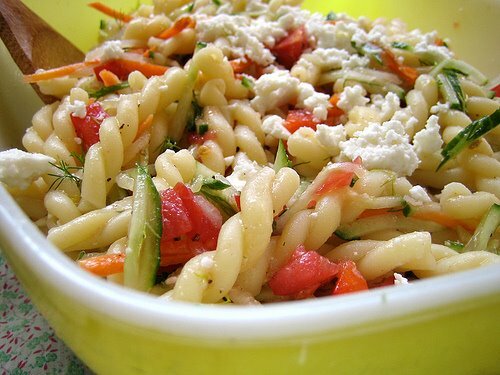 Add the pasta into a large bowl along with the other salad ingredients. Add dressing ingredients to a jar and shake. Pour over salad and toss well. Sprinkle with feta and serve. No tips here, but the salad looks delicious. Have a wonderful trip. I like how this doesn't have mayo because I feel the same way about pasta salads (and I love gemelli pasta). Have fun on vacation- I've never been to New Brunswick, Nova Scotia or Prince Edward Island, but I've heard they are beautiful. Enjoy and I hope you have good weather! What a beautiful and delicious salad! LOVE that it's so fresh and not goopy. Hope you have a wonderful vacation!! looks great- i have lots of dill in my garden right now that needs to be used, so this is perfect. I love pasta salads any which way – even gloopy sometimes – haha. Have a wonderful trip and I look forward to reading all about it. I am eating this salad right now and it is both delicious and fantastic for eating through my pantry before I move at the end of the month (and when the thermometer in my vancity apt reads 30)!! My only little changes (pantry eating, after all…) are subbing in white wine vinegar for apple cider, and extra aged white cheddar for the feta. Looks delish! Have yourself a safe & wonderful vacation! i love pasta salads, i think they make the best kind of work lunches. i'm definitely going to have to be making this! enjoy your vacation – you're off to some beautiful places. oh, and are you planning on any sightseeing in montreal? i know of some GREAT restos here, if you're going to be around for a meal or two. I don't like mayo salads either…too gloopy. I recently rediscovered my love of feta…will have to try this! I Love Feta and I love dill… I'll be picking up ingredients for this salad after work today. Mmm this looks delicious. I love pasta and potato salads with dill – such a nice summery flavour. I steer clear of gloppy pasta salads too. That one looks just wonderful. I can't wait to hear about your trip on your return. That part of Canada is on my travel wish list. -Definitely go around the Cabot Trail in Cape Breton. -Sackville NB is a very cute little town with a cool waterfowl park and a great indie music festival every summer (already happened though). -There are lots of beaches on the Eastern Shore outside of Halifax (Lawrencetown, Clam Harbour, Rainbow Haven, etc). -A nice day trip from Halifax could be Peggy's Cove -> Chester -> Mahone Bay -> Lunenburg. If you do that, I'd also check out Blue Rocks. Just a tiny little spot, but very pretty. – Buy new potatoes and green beans from the side of the road in PEI. -If you find yourself near Truro NS, try to find the Brookfield Bakery (one highway exit south of Truro). It's cheap and wonderful. I'd recommend the baked beans, bread, and almond cookies. – Emma's Eatery on Cow Bay Rd in Eastern Passage (10 minutes outside of Dartmouth) makes delicious fishcakes. Make sure you get salt cod, and order the chow to go with them. I hope you have a wonderful time on holiday. I'm very envious! Justine, I'm hoping for great weather too! Thanks. CookiePie, the salad is so good and fresh. Ash, try it! It's wonderful with homegrown dill. Thanks Bijoux, a gloopy salad can be good on occasion! Yes, Kimberley, great work lunches! We will be doing some time in Montreal, so send me your tips! Alice, glad you enjoyed the salad, it's a good one. Lori thanks for all the tips! Enjoy with or without the feta, Joanne! Yay, thanks for the NB tips, anon! Judy, I always add dill to potato salads, but it really brightens up pasta salads too! Very summery. Thanks Dana, I'm excited and will report back. Megan thanks so much for all these tips! Definitely will come in handy. Stephanie, good to have more NB recs! Thanks so much. Hi there, Cynthia here and I work for Nova Scotia Tourism. We've got so much to see and do depending on your interest, camping, kayaking, cycling, surfing, whale watching, fishing for the outdoor type,vineyards and fabulous restaurants for the foodie, music and festivals for a good downeast time and lots of living breathing historical experiences as well. Would love to give you more info if you let me know your interests. You can email me at Cynthia@novascotia.com and also check out our website http://www.novascotia.com. We also offer help with travel planning through our 1-800-565-0000. Love to give you lots of tips. Have a great maritime vacation! yum, i love how fragrant fresh dill is… this looks like a stellar salad jeannette! have an awesome time on your vacay too! This looks like the best pasta salad ever. I can't wait to make it! Oooo, that salad looks very tasty! I'm from Nova Scotia, and I've travelled a little bit around the Maritimes. Here are my suggestions. If you're in Saint John, check out the Reversing Falls. St. Andrews is a rather pretty little out that way as well. I'm going to second the Kouchibouguac rec. Anne of Green Gables' house. Cavendish is very pretty. Definitely go to a beach – Cavendish tends to be busy, but there are lots of smaller ones all over the island. Be sure to try Cows ice cream – so tasty (novelty t-shirt purchase is optional). The Annapolis Valley is beautiful. Wolfville is a very charming town with a great little outdoor farmer's market on Saturday mornings. Make sure you take the back roads and not the highway, as they are lots of pretty gardens and old houses. If you're heading that way, go whale watching on Digby Neck. August is the best time of year for it. If you're in Lunenburg, go to Magnolia's and order the key lime pie. It is by far the best I have ever had. There's a whole lot to do in Halifax: visit thecoast.ca for event listings (Busker Fest from August 6th-16th), ideas for ways to spend your time (I recommend the Natural History Museum), and restaurant reviews (the toasted ham hero at Salvatore's is one of the best sandwiches I've ever eaten). Sounds great! Last night I was all obsessed with putting tomatoes and cucumbers together with basil, I hadn't thought to try dill. There will be a next time. You ahve inspired me to try pasta salad again! I have decided that August is my month of salads! Maybe I will be ispired to start blogging again. Thanks for the pasta salad recipe. Oh, I am jealous of your trip sounds perfect…I have never been to the maritimes…but I have been to Montreal. You must visit the Jean-Talon market http://www.marche-jean-talon.com/ I went in Feburary and it was great…I can't imagine what wonderful things are there in the summer! Also in Montreal is a cafe called Olive et Gourmando at 351 St. Paul Street West….Yumm! Enjoy your time away. Mmm, nothing beats the heat like cold pasta & dill. This salad looks great! I love dill: it has such an unique flavor! Ah, yes. Fresh dill from the garden can transform a dish. This must have been delightful. I'm sooo happy the weather has finally cooled down!! It was even raining today. 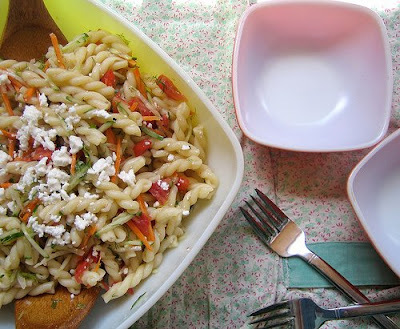 I love pasta salad – this one looks yummy! Love your choice of pasta to use too. Are you still travelling? I'm from Halifax and if you're going to be in NS you should check out Peggy's Cove and Blomodin park on the Fundy coast. The tides go out soo far, it's so beautiful there. I love pasta salad when it has a bit of dill in it. This sounds perfect.